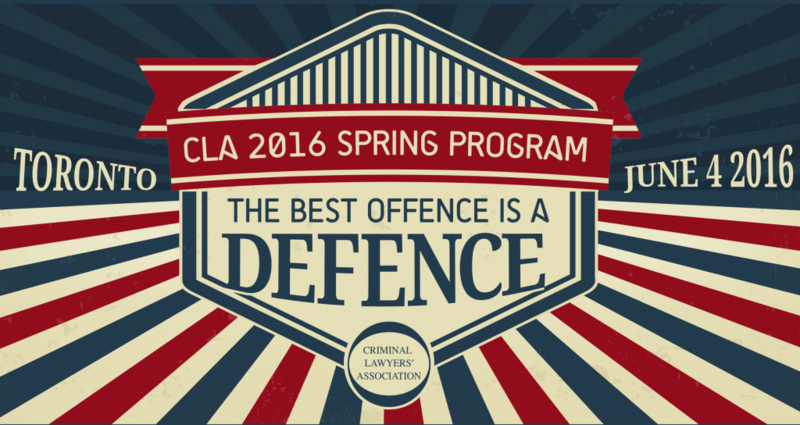 THE 2016 CLA SPRING CONFERENCE Webcast and Electronic copy of materials can be purchased! To order, please call the CLA office, during business hours of 9 a.m. to 5 p.m., with visa or mastercard information. Please call 416-214-9875 and ask for Alex Lee. Once payment has been processed, webcast and materials will be emailed to the buyer. Date & Time: Saturday, June 4, 2016, 8 a.m. to 1 p.m. The Criminal Lawyers’ Association 2016 Annual Spring Conference held on June 4, 2016 has been accredited for 45 minutes of Professionalism Content. This program is also eligible for 3 hours and 25 minutes of Substantive Content. This year’s Spring Conference was inspired by the Netflix documentary “Making a Murderer.” Had this Manitowoc prosecution taken place in Ontario, the various panel members who are a part of this years’ conference would have shed a completely different light on the two concurrent prosecutions in this case. The first panel “Defending the Statement Case” will review how to challenge the admissibility of a statement given by the poor accused person who succumbed to the pressure of police interrogation by telling the officers what they wanted to hear. They will review the methods used and circumstances under which the statement was taken and direct counsel to the appropriate case law to support their argument of exclusion or inclusion of the statement. “Defending by Pointing Elsewhere” is something we all want to do as defence lawyers – to show that it could have been the “other” person who committed the crime, and not our client. This panel will discuss what applications, if any, are required to do this, and when this finger-pointing defence should and should not be used. Of course in every criminal charge there is an investigation. “Defending Against a Manitowoc Investigation” leads us into how to review the disclosure and look for faults in investigations and techniques used by police and how such errors can be used to raise a reasonable doubt in the case at bar. For the very few of us who actually represent guilty people, the “Defending a Guilty Accused Ethically” panelist will assist in understanding our duties under the Rules of Professional Conduct when conducting a trial with an actual guilty accused person. Finally, it is always our pleasure to have junior lawyers speak on topics that have been bantered around on the CLA Listserv. This year we have three talented new’ish lawyers speaking about 1) Scapolletti – does it still exist? 2) Officers planting evidence; and 3) timing and disclosure of police misconduct. As always, we had fun with the theme of this year’s conference, and we hope that you enjoy it as much as we did creating it.